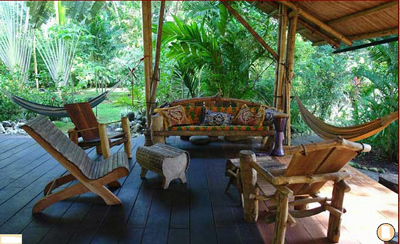 Ojo is not the typical boring vacation spot; cute cabinas are scattered throughout the jungle and are open on two sides so you are literally living with the Costa Rican wildlife. This place is very fairly priced, located in front of a beautiful beach, offers fabulous ambiance, and gives the traveler the ability to stay as close to nature as possible while having all the necessary comforts of a cozy bed & breakfast. 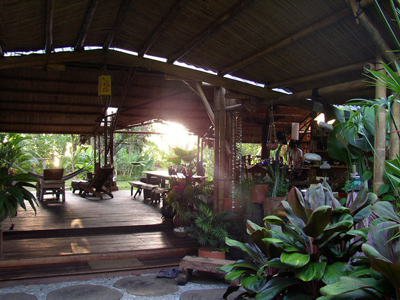 The sustainably built bamboo architecture, the thoughtfully designed jungle garden that provides complete privacy, the tempting library and copious hammocks, the magical candlelight and tantalizing food and interesting international guests, are all most appreciated after vigorous yoga and hiking. You love lots of places in Costa Rica but this is the one you dream about. If you are looking for all you can eat and drink with waterslides, than this isn’t for you. If you are looking for a relaxing, grounding, healthy paradise, then you need to see Ojo del Mar’s 6 rustic, airy, elevated cabins for yourself. These are as close to nature as you can get. The cabinas are very privat and hidden in the forest. The tents are a good option for those traveling on a budget. Both the cabins and tents are neat & cozy. The tents are closest to the crashing waves and the cabins are a little more private as they are privately set among beautiful tropical gardens and trails on the property. The rooms are wide open, but you have comfortable orthopedic beds, some have double beds, others have two twin beds that make into deluxe kings with nice mosquito nets. 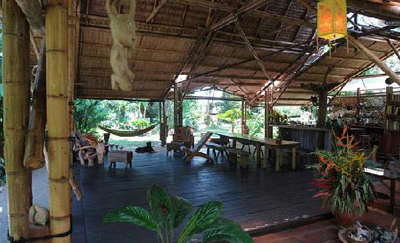 These cabins are very close by to the sea and you may relax in the hammocks at the beach. In this part of Osa nearly the complete rainforest was cut down in the 70th. Only some private properties have saved some parts. Each cabina has its own mosaic-floored outdoor garden shower and sink. Most come with a private bathroom, two cabinas have their own bathroom under the same roof. 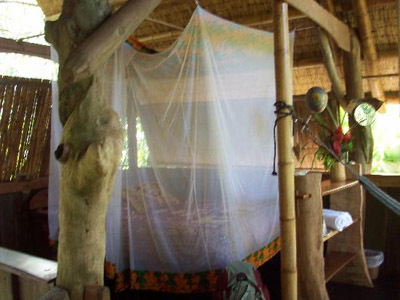 They also offer two small locally hand crafted Bamboo Tiki tents for 2 people with either a double or 2 twin beds. These spacious, close to the ocean tents are perfect if you are traveling on a budget. Are you ready for a deep flowing, juicy Yoga class in the heart of the jungle at the edge of a secluded beach with scarlet macaws above and warm breezes all around? They offer every-classes of Hatha Yoga, a yoga system of physical exercises and breathing control to obtain harmony and balance for body and soul. Here, Yoga is a way of life! 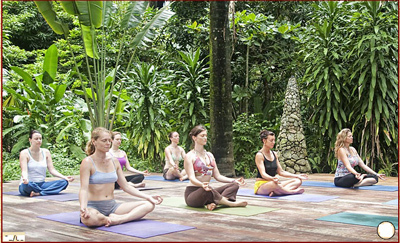 Their beautiful open-air wooden deck right on the beach shaded by cool giant palm trees and towering almond trees overlooking the Golfo Dulce provides the perfect environment to practice Yoga. Oja del mar is located directly at the beach, with a yoga deck facing the water. A huge dining/social cabina offers a welcoming atmosphere for incredibly tasteful dinners. Think about candle light romance in a rain forest setting, shared with parrots, monkeys, iguanas and an occasional mosquito (just a few), and you get the idea. Ojo is a dream of a vacation for folks who want a peaceful, dream like adventure, living with wildlife. Monkeys awaken pre dawn. This is no luxurious spa. There is no electricity or hot water. 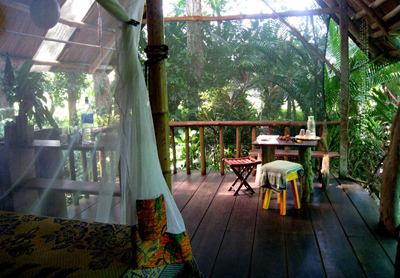 Enjoy the sensuous pleasures of being in the jungle.